Earlier this year, when I heard the Television show, Antiques Roadshow, was planning a summer visit to Washington D.C. for a taping, I just had to go. We signed up online a few months ago and were lucky enough to win the lottery for free tickets. It was a great deal because, while standing in line, someone told us he made a donation of $400 to PBS to get tickets for the appraisal event. I also found out 23,000 people signed up and vied for only 5,000 allowed tickets for entry. 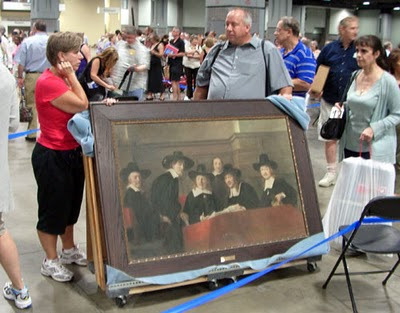 For 14 years, Antiques Roadshow appraisers have been discovering hidden treasures in American's attics and revealing the finds on the PBS TV show. The organizers did a great job with our assigned-time tickets and keep the line moving inside the Washington Convention Center. We waited in the serpentining line for and hour and 45 minutes and chatted with others who brought a plethora of antique items to be appraised. 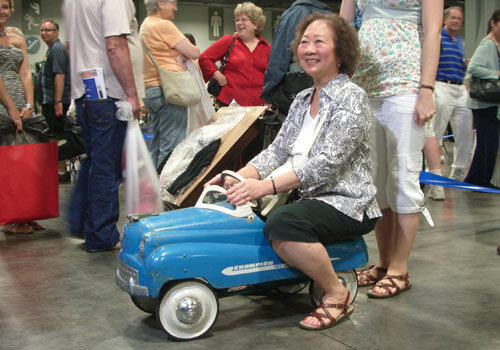 One woman inched along atop a vintage metal peddle car which she used herself as a child. A man carried an antique print for which he claimed to have paid $10,000. Another man jokingly offered anyone who would listen big money for their items. Daniel V. said, "This is actually like show-and-tell for adults." As we approached the show floor, we described our items - only 2 per person allowed - and got tickets to specific item categories: collectables, furniture, paintings, Sports memorabilia and so on. Naturally, I bought some souvenir buildings and was sent to the collectables table for an appraisal. After another short line, we arrived at the table and I displayed the buildings I brought. I chose two miniature architectural replicas from my collection which were antique and had stories behind them. The Statue of Liberty I brought was originally sold for $1 to raise money to fund the construction of Ms. Liberty's base. The original Union Dime Savings Bank is very rare and made by Rehberger. Our appraiser, however, didn't think much of them. "You and get these Statue of Liberty's all over New York." He said. When I told him the history behind this miniature statue, he didn't seem too impressed and gave it a price of $35. Hummm. He priced the Union Dime the same and I had to smirk. I'm sure anyone who reads this blog knows the value of this baby is in mid 3 figures. I forgive the appraiser as he has to be a generalist and can't know the details and nuances of each type of collectable. I was happier with what the decorative arts appraiser told me about the mid-century Eero Saarinen-designed floor lamp I brought. Alas, in the end, our items did not deem worthy of an on-camera interview and appraisal, but we did record something in the Feedback Booth. We tried to say something unique and interesting and will cross our fingers until next year when this episode airs. 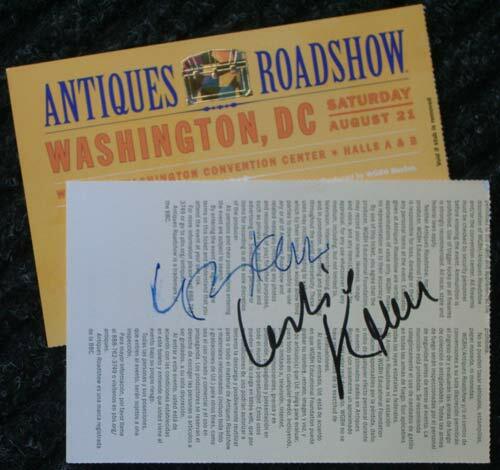 We also got to meet the rockstars of the antique world, the Keno brothers, and had both Leigh and Leslie autograph the back of our tickets. It was a fascinating behind-the-scenes look at this popular TV show - the ONLY show I must watch each week. Dave - I'd gladly give you double his estimate for the Union Dime bank. Great story and what an adventure! Lucky you.